NFL football is back, and Microsoft’s Bing has returned with its crystal ball, picking the best bets for Week 1 of the new season and looking ahead to the predicted Super Bowl winner: the (yawn) Carolina Panthers. For week 1, Bing has also picked three upsets: Buffalo Bills over Baltimore Ravens, San Francisco 49ers over Los Angeles Rams, and New York Jets over Cincinnati. Unfortunately, Bing already missed one: Carolina, which Bing predicted had a 57 percent chance of toppling Denver at home, lost 21-20 on Thursday night. Each year, Microsoft’s Bing search engine factors in historical performances, the location, and other factors to determine the winner of each game. The company also runs simulations of the entire season to try and figure out which teams will make it to the playoffs, and end up on top: Carolina over New England, at this point. Bing’s predictions don’t take into account the score, so you’ll either need to factor that in yourself, or simply go with the upsets. For example, at press time, the betting aggregator VegasInsider.com was giving 2.5 points to the Jets—which Bing thinks will win anyway. Bing’s predictions for Week 1 of the NFL football season. Bing also makes fantasy football predictions, too. Note that you don’t have to search constantly for Bing’s NFL predictions to see how your team will perform. In Windows 10, you can set up Cortana to track your interests, which can include your favorite NFL team. To do so, click the Cortana search box, then the Notebook icon to the left (directly below the Home icon, which not surprisingly looks like a little house). Scroll down the Notebook's list of topics and click Sports. There, you can add any teams you want Cortana to follow, or Cortana will suggest local teams to follow. You can also enable or disable notifications, score updates, and upcoming game information for your chosen teams. 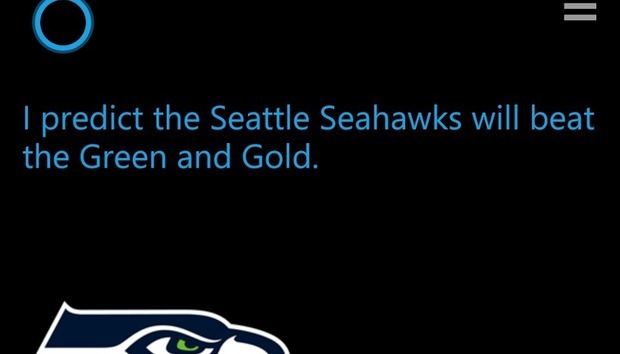 You can use Cortana to track your favorite NFL teams, too. The Windows 10 platform offers scant few apps to follow the games, but Microsoft’s curated Touchdown collection offers some good suggestions. Among them is NFL on Windows, a Microsoft Studios app that offers a great second-screen experience to follow the games as they unfold. Microsoft plans to update its predictions continually for each week, so you’ll need to check back frequently to see how the NFL season unfolds.